Whenever Starbucks starts advertising their trademark Pumpkin Spiced Latte, that should be your signal that fall has arrived and it’s time to add some fall décor to your home. I’m not just referring to adding a few pumpkins to your front porch. This year try to step your game up a bit by using plants to add some outdoor style to your landscape. In this article, you will find great tips and ideas on how to take your fall décor game to the next level. Let’s start with adding hay bales to the front yard. No fall outdoor decoration is complete without at least one hay bale. Even if it’s just for holding your plants or for your pumpkins to rest, hay is a must. Hay can be useful for seating if you have a party or even a great setting for that perfect family photo. One common fall decoration are mums. Mums are one of the many go-to plants in the fall as they come in many colors and are late bloomers that are easy to maintain. Because mums are equipped with a tight and mounded habit bloom cover, they can be easily planted in mass quantities. Grab a few in different colors from your local nursery or hardware store and plant your own color way to add some brightness and life to your yard. Mums come in a wide array of colors. Don’t hold back on picking the ones that best fit your outdoor style. With such bold colors as bronze, reds, whites, and lavenders, mums can do miracles for your outdoor style this fall. Complement your mums with other plants such as evergreens, ornamental grasses, Montauk daisies, and many other fall perennials. Just because the leaves change color, doesn’t mean your trees and shrubs have to too. The many shades of green can really add and extension of beauty to any passageway or flower bed around your home. Utilizing ornamental flowers like the Ivory Feathers Pampas Grass or fall perennials like Asters will add depth and complexity to any landscape. 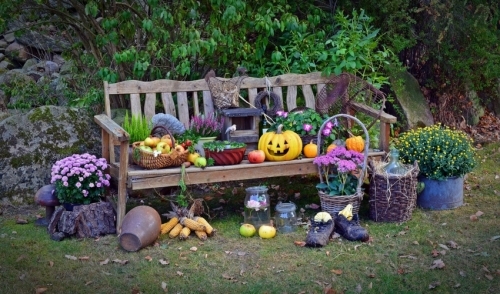 Another popular practice when it comes to fall decoration is using cool weather vegetables and other foods outdoors. Items such as pumpkins, gourds, squash, and ornamental peppers reach their prime in the fall and can be used for both dining and décor. Decoration is a must during the fall season. With both the Halloween and Thanksgiving holidays during this time of year, you want your home to shine. Get creative and use plants, ornamentals, and hay bales to increase your outdoor style before it’s too late.